Frank Russell is the Director of the University of Cincinnati Community Design Center and the Niehoff Urban Studio and is Adjunct Associate Professor of Practice in Planning and Urban Design. He is a Registered Architect and Urban Designer. He came to the University of Cincinnati in 1990, helping to establish the Center for Urban Design in 1990 and serving as Assistant Director and Adjunct Associate Professor. There he provided teaching, research, and community outreach in professional architectural and urban design. 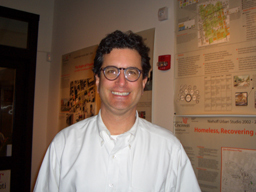 He has carried out numerous community based urban design and architecture projects throughout Cincinnati and since 1996 has directed the Community Design Center, a state sponsored community outreach department of the College of Design, Architecture, Art, and Planning. Beginning in 2002 Frank initiated the Niehoff Urban Studio in partnership with the DAAP School of Architecture and and Interior Design and the School of Planning. This studio, located off-campus in Corryville, provides credit bearing interdisciplinary coursework of students of a variety of disciplines focused on issues relevant to the center city. The purpose of the studio is to engage community stakeholders with students and faculty in an problem solving design and research activity. Russell has written for Cities: the International Journal of Policy and Planning, Design Review: Challenging Urban Aesthetic Control(Chapman and Hall, 1994), and co-edited New Directions in Urban Public Housing (CUPR Press, Rutgers 1998). Frank Russell has been the recipient of major grants from the Ohio Arts Council and the American Architectural Foundation/National Endowment for the Arts, and has directed the Midwest Regional Mayor’s Institute on City Design sponsored by the AAF, NEA, and the US Conference of Mayors. He holds an A.B. Art from Vassar College(1983), received an Architecture Internship at the Institute for Architecture and Urban Studies, New York City (1985), and a Master of Architecture degree from Harvard University Graduate School of Design (1989). Frank Russell has served as a Commissioner of the Cincinnati Park Board and the Cincinnati Recreation Commission. He currently serves as a Trustee of the Cincinnati Zoo, is a board member of the Cincinnati Riverfront Advisory Council, and Chair of the Urban Design Committee of AIA Cincinnati.